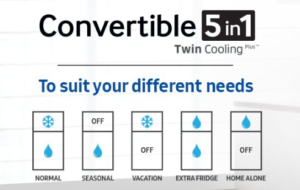 I will be reviewing Samsung 5 in 1 Convertible Refrigerators in this article. The post will cover the list of models available in India, their features and prices. Samsung convertible refrigerator is a revolutionary product range. These products address a lot of issues that Indian women face with their regular refrigerators. They offer a lot of flexibility as well as power saving options for the regular Indian family. You can browse through the models available in India before producing the review article below. The fridge can be operated in one of the five modes shown above. I will help you understand each of the modes briefly below. This is the mode that you would be using on regular days. This mode is designed for optimum cooling in both the refrigerator as well as the freezer compartment. Both these compartments will operate like any other refrigerator in normal mode. Most Indian Women/Families will relate with me when I say that there are days in your kitchen when your fridge is overflowing with containers while the freezer is empty. You can use this mode in such situations to convert your freezer to a regular fridge. As per me, this one of the most useful functionality to have in a fridge. There are times when you don’t need the freezer at all. A regular fridge will still keep the freezer on wasting electricity and resulting in higher electricity bills. This mode allows you to simply switch off the freezer. Simple but amazing functionality that allows you to save money and energy. If you planning a vacation for a few days. You generally empty the refrigerator of all food items (That will get spoilt otherwise). However, you may still stock some dry fruits, masalas etc which requires you to keep the fridge on during this time. You can use this mode in such situations. You shift the few remaining food items in the freezer section. This allows saving energy and keep your food fresh while you enjoy a long vacation. This mode allows you to convert the freezer section of your refrigerator into a mini-fridge. You can use this section as a regular refrigerator while the bigger area of your machine remains powered off, resulting in huge power savings you during this duration. You can watch the commercial below to get more idea about the modes discussed above. Although the official website shows over 30 models that use this technology, I have shortlisted 5 best models that should suit most Indian households. A good product for a family of 3 to 4 people (Depending on the usage). This is a 2018 model by Samsung and uses Digital Inverter Compressor. The product is rated as 3 Stars and gives you energy savings of about 35%. Freezer and refrigerator have two different cooling systems. This helps the section cool more efficient and without passing any odours amongst the two sections. Has Power Freeze and Power Cool functionality for faster cooling. Samsung provides 1 Year comprehensive warranty on the Product and 10 Years on the Compressor. This product comes inbuilt with a stabilizer. So if you do get minor power fluctuations at you home, you should definitely go for this product. The price difference is not much between the two models. 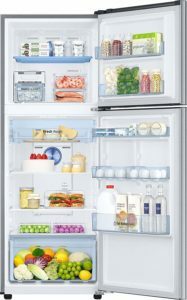 This is the third product in my list of best Samsung 5 in 1 Convertible Refrigerators in India. This is one the best selling product from this range. Uses Samsung’s Twin Cooling Plus technology. It uses two separate airflows in the fridge & freezer. This allows independent temperature control for both sections. The compressor uses the latest digital inverter technology. The video below shows the demo of the product. The expert shows how to configure and use various modes. The audio quality of the video is not great. I suggest you use headphone while watching the same. I see no drawbacks of using this technology. This functionality only enhances the options that we have of using our refrigerator the way we want it. A lot of critics of this technology claim that it is useless as most people use it only once or twice a year. However, my personal experience has been very different. The mode which lets me convert the freezer into the fridge is often used by me in my home. There are also instances when my family go out for weeks. At at time the mini freezer mode is also very useful. It saves a lot of space and power, which otherwise would have gone wasted. Alternately, you can also look at the Best LG Refrigerators in India. 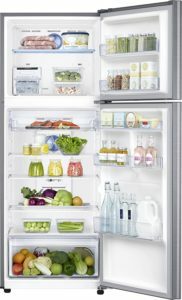 They also have some amazing refrigerators in their product line. This brings me to an end of my review of Samsung 5 in 1 Convertible Refrigerators. Do let me know your thoughts about the product offering from Samsung in the comments below. Are you convinced enough to buy this product?